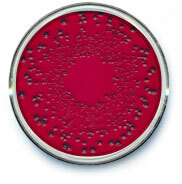 Salmonella spp are perhaps the most widely known of the food poisoning organisms. The organism is named after Daniel Salmon whose partner first isolated the bacterium from pigs in 1885. There are many different groups within the species and many different serotypes (groups) within the groups. The most commonly used grouping system today is probably the Kauffman White Scheme which includes all the the different serotypes within a group, A, B, C etc. The groups themselves have little significance as to the seriousness of the organism and infection it produces and are generally used for epidemiological purposes. Cheshire Scientific is approved by DEFRA (formerly the Ministry of Agriculture, Fisheries and Food) for the isolation of Salmonella spp from animal by-products under the Animal By-products Order.